Written by Kristin Wilcox, blog originally appeared on Marketlinks, posted on July 31st. Cooperative businesses have a simple formula for success — Aggregate production or services to reduce input and overhead costs and distribute profits based on participation. After partnering with over one hundred cooperatives through USAID's Cooperative Development Program (CDP), I can say cooperatives generally make improvements in quality and quantity of service/production and gain market confidence within a short time. The incentive to join is clear. The benefit of cooperation for economic inclusion is straightforward — with a bit of ingenuity and a lot of perseverance, it could be profitable. It puzzles me that cooperatives around the world — innovative, flexible, and democratic — still struggle to attract youth. So in 2016, with support from USAID, we began a pilot program in Nairobi to work with young, urban professionals interested in starting their own cooperative businesses. Our goal was to leverage the service economy, appeal to the growing middle class, and get smarter about youth and the cooperative business model. The challenge, as it turned out, was not lack of attraction to the business model. Right away Global Communities was able to begin working with several groups of professionals and college students who were already finding their market niche providing a variety of services in marketing, IT, beauty, and building and construction. The challenge in Kenya was actually working with the public and the private sectors to envision cooperatives as businesses that could be involved in any sector, especially services, rather than pigeonholed as collectives which traditionally operate in agriculture, housing, or savings. In truth, there are hundreds of service cooperatives in Kenya — just look at any boda-boda (motorcycle taxi) or minibus weaving through the crowded streets of Nairobi. They are all registered cooperatives, but they aren’t service cooperatives. The drivers all proudly bear the name "SACCO" on their vests or windows. The word is so ubiquitous in transport that a friend once asked if the word SACCO meant "bus" in Swahili. Nope! SACCO is the acronym for Savings and Credit Cooperative Organization, a popular form of savings and microfinance often referred to as a credit union in the United States. So when working with new cooperatives interested in providing services such as construction, IT, marketing or even salon services in Nairobi, it was really the public sector that needed the orientation. At the time, cooperatives struggled to become registered to operate. Then, after successful registration, services cooperatives further struggled with how to market their services in a way that could be understood by the private sector. It was an uphill battle. What does this tell us? Innovation and determination have led the market, but awareness and education are the winning factors. After over a year and a half working with local governments and existing cooperatives in the housing sector, Global Communities was able to help facilitate a growing network of cooperatives which work together to broaden awareness and shift perspectives on cooperatives. The network aims to promote cooperatives as profitable businesses that can operate in any sector. The new service cooperatives which partner with Global Communities are the first service cooperatives to have registered in Kenya. And while they are still growing businesses, they are working with the Department of Cooperatives and the Ministry of Public Service, Youth and Gender to talk about their successes as a collection of professionals who are co-owners of their own businesses, a critical part of the education process. They are also models for what is possible in urban and peri-urban areas across Kenya. As a result of their early successes and our partnership in networking and education, the legislation is now changing. Local governments are seeing possibilities for economic inclusion and young professionals are seeing new opportunities for start-ups. The combination of the two has been the challenge, but it’s also been the solution. ​This is the tenth post in the Cooperative Development Learning Series, which highlights learning from USAID’s Cooperative Development Program and was authored by Kristin Wilcox. Click the links to read the first, second, third, fourth, fifth, sixth, seventh, eighth, and ninth posts. Kristin Wilcox has over 10 years’ experience working in global development. She has served as Chief of Party for the USAID/Enabling Market Integration through Rural Group Empowerment (EMIRGE) program since 2013 providing strategic and technical leadership to the cooperative development program. As Technical Specialist she provides technical expertise on a wide range of economic development and livelihoods focused programming with a special emphasis on inclusive business design and implementing value chain competitiveness and market integration strategies. ​A new study published by CICOPA, the International Co-operative Alliance's sectoral body for industry and services, as part of its campaign, "We own it! The future of work is ours," indicates that the cooperative economy is providing quality employment and entrepreneurship opportunities for young people. Based on research and an online survey of 64 youth cooperatives across five continents, the study indicates that—in a world of work deeply reshaped by demographic changes, globalization, technological innovations and youth unemployment—cooperatives can be a concrete tool in the hands of young people for improving their work and entrepreneurship opportunities. The study also reveals a dynamic picture of youth cooperatives who took part in the survey. They are primarily active in the service sector, and are highly involved in activities requiring a certain degree of training, specialized knowledge and skills (e.g. telecommunications and information technologies, programming, legal and accounting activities, management, consultancy, research and marketing). In most cases, they are micro or small-sized enterprises and have reported a positive economic performance and increasing or stable trends in job creation in recent years. They reveal gender equity in management positions and are extremely keen to implement new organizational methods in their business practices (e.g. workplace organization and governance practices). Their cooperative choice is justified by a mix of value-based and pragmatic motivations: meaningful work (to “work differently”), experience and values-related aspirations, but also concrete need for stable jobs, career opportunities and protection. This picture, albeit partial, strongly suggests that youth cooperatives are riding the wave of changes and represent a valuable and secure option for young entrepreneurs. The global study also shows how cooperatives can play a crucial role in responding to new challenges introduced by recent work and economic transformations affecting new generations. For example, they can inject democracy and participation inside the digital economy, by giving ownership and control to the people who use and work through online platforms. Through their participatory governance, they are a laboratory in the hands of young people for the experimentation of innovative and sustainable forms of work. However, the study concludes, cooperatives should not be considered a panacea. Besides the important and increasing involvement coming from the cooperative movement to address youth needs, cooperatives are only able to display their full potential if they exist in a favorable institutional environment. This is particularly true when it comes to providing quality employment and entrepreneurship, which is highly dependent on the institutional frameworks regulating cooperatives, the legal status of young workers and worker-members, and access to financial resources and user-friendly bureaucracy. Read the "Global Study on Youth Cooperative Entrepreneurship" here. In the Nairobi’s Eastland’s area houses, there is a neighborhood called Babadogo. It’s an informal settlement that was previously affected by post-election violence, and faces various constraints such as unemployment, poverty, and crime. In the midst of this unfortunate circumstance for this neighborhood, a group of resilient, skilled, motivated and qualified artisans came together, and formed a construction service co-operative called FundiTech – the first of its kind after over 25 years in Kenya – whose primary goal is to provide improved access to employment for professional builders and technicians. ‘FundiTech’, which emanates from the word ‘fundi’ – Swahili for artisan – is first and foremost a co-operative for certified builders and construction trade workers. Supported by USAID through the Enabling Market Integration through Rural Group Empowerment (EMIRGE) program, it redefines the way reliable fundis are integrated in the building and construction industry to provide quality service delivery, while upholding the spirit of the democratic business entity that they are. In Kenya today, quality and reliable fundis are scarce; this poses a challenge for most contractors in the industry, and deepens the lack of trust they have towards the work that can be performed by eventually capable and trained artisans. With its ability to bring together skilled artisans with various specialties and expertise along the construction value chain, this creates an opportunity for Funditech to fill a gap both socially and economically. For Funditech however, market access is one of their major challenges. As FundiTech’s Secretary Jane Muriithi, explains: “The biggest problem for us now, is gaining grounds in the market”. Kenyan fundis have consistently struggled with poor reputations and are often subjected to exploitation by developers. Imbalanced power structures, lack of ability to unionize to negotiate for better pay, and the increasing supply of low wage migrant workers from neighboring countries have challenged licensed fundis’ abilities to advocate for themselves. Rather than offering short term contracts, contractors often hire fundis as day laborers who do not represent a brand, specialty service or service provider; this situation has led to increased incidences of poor workmanship among the artisans. Developers or contractors who want greater profit margins opt for unskilled or unlicensed artisans who are likely to quote lower rates to do the job, undercutting skilled labor. As a result, the fundis have borne the brunt of the reputational damage and driven wages lower. The FundiTech model differs from a traditional single owner or limited liability business model in that every member is also a part owner of the business and they participate in the oversight, often the management, and the profits of the organization, all of which is determined using democratic practices. Just like many cooperatives or inclusive business models, members own the majority of the equity in the business, guaranteeing them job security. The model produces an array of economic benefits for various social classes, including low-income communities by ensuring that income is distributed fairly and equitably among members, and not simply heavily concentrated at the top (administrative managers, directors, etc.) like in traditional businesses. Registered in December 2017 as a Service Co-operative in Nairobi, FundiTech has come a long way. Six months before, they lacked internal systems and operational mechanisms to facilitate their budgetary and business operations. With the support received from the USAID/EMIRGE Kenya program, on capacity building and market linkages, and their will to thrive as a functioning inclusive business, they were able to successfully hire a qualified General Manager and turnaround some of their internal processes. A year later, they have scooped contracts with contractors and developers in Nairobi worth over USD $90,000 using their own labor and financial resources, and are proud of how far they have come. In the wake of unemployment that has left many individuals and families unable to meet their most basic needs, FundiTech has filled this gap by providing longer-term jobs, skills training, and better wages than similar jobs in conventional companies. Members of FundiTech, who mainly come from the little town of Babadogo, are transforming the way fundis are perceived, and are serving as examples to follow for youth through their sense of resilience, despite social shocks plaguing their community. Members are linked to jobs in line with their specialty and expertise, and are regularly encouraged to develop new business opportunities for the co-operative, which are rewarded through commissions. FundiTech’s business model also contributes tremendously to the “Big Four” plan from the Government of Kenya, particularly around the challenges faced by the housing sector, which revolve around the cost of building quality and affordable housing units for low-to-middle-wage Kenyans. Workers-oriented cooperatives such as FundiTech are a useful tool to achieve broader goals in the workforce system. Skilled unemployed individuals in many other sectors operating in the informal economy can learn from this successful exploit by FundiTech, and apply some of those lessons to start similar cooperative businesses. In other words, when are you going to go public or sell your company to a larger company so I can cash out with 10 times my original investment? With a conventional profit-driven company, this might not be a big deal for consumers, workers, or suppliers. For companies primarily with a social mission, however, it means the end of the mission. But you can’t get that investment money without having a plan to sell out – call it the Exit Strategy Trap. We’ve seen it over and over among companies that were once our peers in driving change in food and consumer products. (Dr. Phil Howard has put together an excellent graphic of the consolidation of the organics industry.) Despite the rosy statements when big piles of cash are being exchanged, once the mission-driven company becomes a cog in the machine, it ceases to be an agent of change. How did Equal Exchange avoid this Exit Strategy trap? It’s not because we don’t get offers. We get them all the time. It’s not because we’re more noble or purer of heart. A lot of folks at our company would welcome a windfall payout in exchange for our ownership stock. The answer is in three parts. First, our democratic worker co-operative model means that a decision like this would have to be approved by 2/3 of the worker-owner members of the co-op, and we each get an equal vote. Unlike faceless corporate investors, we’d be voting to end the social part of our company for ourselves and our co-workers. We’d have to look them in the face, and look at our reflection in the mirror. Second, we’ve figured out how to raise the investment capital from sources that mirror our social mission, from over 600 investors, dozens of mission-driven lenders, and over $2 million from our own workers. You can find a deeper description here: http://equalexchange.coop/blog/cooperative-capital. Third, recognizing the Exit Strategy Trap early on, the workers in the company adopted what you might call the “No Exit Strategy.” Essentially, this established a rule that in the event of a sale of the company, we couldn’t keep any of the money. All loans and investments would be returned at face value, but all the net proceeds of the sale must be donated to another Alternative Trading Organization. All we’d get is a new corporate boss. By taking the money off the table, we took away the temptation to ever sell out. What stays on the table is a shared obligation to run the company for the benefit of all stakeholders: farmers, workers, consumers, and the environment. Why would we ever want to have an exit for that? ​Just like any business group or SME seeking to grow and expand, cooperatives often have to come together and make important decisions regarding the type and size of investment necessary to increase their production and improve member livelihoods. But, it is not always the case for various producer groups in Mongolia who are constantly faced with external and internal challenges, leading to ineffective decision-making processes around investment. In August of 2017, Members of a local cooperative in the Darkhan-Uul province borrowed a fodder cutter from another group, which obtained the equipment for free under the Disaster preparedness project and never used it. By the time the members of the cooperative tried to use the equipment, they realized that it was not actually a fodder cutter, but instead a grain mill. Furthermore, the equipment did not have any power input socket. A sprinkler irrigation system was given to a local cooperative under the Markets and Pasture Management project in 2015 and was kept without use. After planting green fodder plants such as oat and peas in early July in the group’s fodder field, the members attempted to install the system to irrigate the land; but when they tried to connect the system to a well, it was discovered that many small parts such as fans and hoses were missing. The group members spent a great deal of time and effort to put together missing parts and get the system to operate. However, the system did not work properly and was not good for further use. They had to replace it in early August. The senior management of a local cooperative made an incorrect assessment of the conditions and opportunities of the group, and invested resources in the acquisition of distillation equipment. However, due to improper planning, lack of communication with the coop members, and lack of training and experience in using the equipment, the cooperative has not been able to use it for over two years now. ​Under the EMIRGE program, partner cooperatives have received capacity building in their specialization, business advisory services and market linkages that are tailored for their daily activities, and have enabled them to make smart decisions for their own investments. Cooperatives have learned how to make investment decisions around important products and inputs such as irrigation systems for greenhouses or small farm fields, small tractors, milk cans, curd dryers, and lactoscans. Our partner cooperatives are now able to vocalize their needs to supporting organizations for additional equipment, parts, or tools that are needed for their daily operations. This approach lowers the risk of aid reliance for the farmers, which is always in short supply and not always matching their actual needs. Our results on the EMIRGE program have demonstrated that choosing agribusiness training over donations are well-paired with the objectives of our partner cooperatives and groups. For instance, Devjikhuguuj group, one of the program partner cooperatives, approved and implemented a decision to invest in an irrigation system to protect crops from drought, and increase harvest. This turned out to be a solid investment as the group was able to double their harvest compared to the planned quantity. Many other partner cooperatives are also working with great enthusiasm to expand their businesses in the coming years by: (a) applying investment best practices, (b) learning and developing their ability to acquire and utilize new equipment and technology, and (c) generating new business ideas and initiatives. Smart investments are key to development. The idea of developing and strengthening service oriented co-operatives in Kenya was a key initiative under the USAID/EMIRGE program. Three service sectors were identified for pilot purposes to include branding and marketing, building and construction, and beauty and wellness service groups. After 12 months of formation, capacity building activities, and processes, only the group of free-lance sales agents had successfully established the Brand Ambassadors and Marketing (BAM) Co-operative Society. Implicitly, starting a new co-operative takes energy and resources! These queries ensured that the group would be saved from making expensive mistakes and losing valuable time. ​The essential learning in the efficient and timely establishment of BAM co-operative, was coherent adherence of the following step-by step procedures. First, was the sensitization, identification and assembling of the group members who were were interested and willing to work together. ​A group of over 200 young sales agents were sensitised and mobilised on the need of using co-operative business model to offer sales and marketing services. Afterward, the relevant information was collected and feasibility undertaken, and unanimously acknowledged by the majority of the potential members that there was mutual need for a co-operative business. ​The second step by the EMIRGE team was to hold several meetings of potential members to discuss needs and vision. Numerous pre-co-operative education and training activities were conducted to understand the co-operative business model, structure and system, roles and responsibilities of members and leaders. Then, a co-operative steering committee was selected to coordinate business research on whether there is enough interest in a co-operative to justify further co-operative planning. With the potential members having sufficient interest in the co-operative business model, the EMIRGE co-operative development team supported the steering committee to conduct an economic feasibility study on whether the proposed co-operative is likely to be successful and beneficial to its members by determining important factors including markets and volume of business, potential membership, facilities needed, operating costs, capitalization and funding options. It was confirmed in this stage that the young potential members had sufficient skills and capacity to start a branding and marketing co-operative. When the members positively affirmed that the co-operative would make practical and financial sense, more meetings were held to affirm their commitment. It is at this juncture that the EMIRGE team supported the group to develop their three-year businesss plan. The plan was to define how the co-operative would be structured and financed. The group’s 2018-2020 business plan was to substantiate member benefits and the co-operative’s short and long term viability. Subsequently, short workshops were convened to review the business plan in which more adjustments were made by the potential members. By this time, the number of potential members had reduced to only 20 percent of the original number. 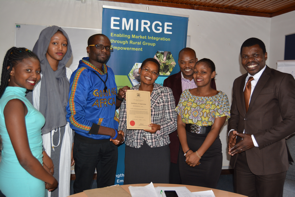 But given the legal provision in Kenya of the formation of a co-operative is 10 members, the EMIRGE team, together with the co-operative officers, supported the group with drafting legal papers to secure the membership commitment. The by-laws would clarifed co-perative organisational details, prepared necessary legal papers for registration, and secured the written and financial commitment of members. Through the State Department of Co-operatives Development, BAM co-operative was officially registered. The inaugural co-operative general membership meeting was held and official board of directors elected. In essence, the members formally began the co-operative and accepted the articles and by-laws. Today, the BAM co-operative leaders are working with the members to implment the three-year business plan. The official start up operations are on with the co-operative securing finances and permits and licences required, and seeking sales and marketing businesses from various partners. The co-operative is already getting recognition from County Government of Nairobi City and Corporate organsiations while establishing and maintaining communications with members. From this process of BAM co-operative compared to other two service groups, it is clear that each (pre)co-operative has unique aspects and faces different start-up challenges even if there are common areas critical to the future success. The main reasons that new co-operative businesses fail are insufficient financing and lack of business expertise. Starting an co-operative can be a challenging and yet, rewarding activity. It requires research, careful planning, patience, and uncounted hours of time. The co-operative may not turn out exactly it was originally conceptualized. Some will inevitably take longer than you wish it would to get started. As a dairy sector specialist, I see that current chaotic competition for fresh milk at the sourcing stage is not helping anyone, including milk producers and dairy processors. Therefore I want to discuss this issue with you. I have been working as the EMIRGE program dairy specialist for 5 years now. Our program works with rural dairy cooperatives and groups as well as relevant organizations in the sector to build mutually beneficial relationships between dairy value chain actors. We are working towards improving opportunity for dairy cooperatives and farmers, to produce and supply the market with quality milk at favorable prices. Experts and researchers point out that milk production in the dairy producing region of Mongolia is limited, it produces 45 million liter tons of milk annually. On the other hand, 5 large dairy processors in UB, with combined processing capacity of 450 tons per day, compete in this region to source milk, each of them following different competitive strategies. This competition has been increasing since 2014 and has intensified even further in 2017. The reason is declining milk production at the farm level. Milk production in the main milk producing region declined by half in 2017 due to extremely dry summer and poor vegetation growth. Consequently, dairy processors pursuing high price strategy in their competition for scarce resources. Scarcity and fierce competition for milk resulted in the following: 1) price of fresh milk increased by 45%; 2) quality of milk declined; 3) dairy processors’ profit declined. Furthermore, milk producers’ income did not increase and in fact it saw a decline. For example, a farmer used to make income of MNT20,000 per day in the summer of 2016 by producing 40 liters and selling at MNT500 per liter. Whereas, in 2017 the farmer is making MNT18,000 per day by being able to produce only 20 liters a day and selling at MNT900 per liter, making MNT2000 per day less than previous year. ​Moreover, there seems to be a declining trend in fresh milk quality. For instance, in 2016 Suu JSC used to collect and test milk samples from its’ suppliers on a weekly basis, whereas, in 2017 the company is performing milk sample testing only once a month. APU JSC used to procure milk through its’ milk collection centers upon testing quality using lactoscans, rejecting low quality milk and performing somatic cell testing with milk samples at their processing plant. Whereas in 2017, the company started to send its’ laboratory workers from milk cooling centers directly to dairy farm collection centers to procure milk. Additionally, the company is using 75% alcohol (previously 82% alcohol was used) to perform quick testing of milk quality. This shows that competition for fresh milk is forcing processors to apply lower quality standards in the procurement of milk and therefore creating conditions for a decline in milk quality. Deterioration of milk quality, despite higher prices, is creating higher risk of quality decline in final dairy products; increased return of dairy products by sellers; lower sale; and consequently lower profits. These conditions have negative consequences such as increased use of milk powder by processors, reduced consumption of dairy products by consumers, and lower income generation by farmers. The EMIRGE team believes that, during this age of increasingly frequent droughts and extremely harsh winters (dzud) due to global warming, Mongolian dairy sector participants need to work towards ensuring and increasing stable milk production. This can be achieved by jointly developing and implementing risk management programs, and starting irrigated pasture and hay farming, with the collaborative participation of local milk producers, processors and local government; as well as towards the introduction of good practices among milk producers to protect milk quality and development of quality based pricing system. ​The population of Kenya is poised to grow to over 50 million in a few years. This has meant there has been, and there will be, continued increase in the number of students transitioning from primary to secondary school, and from high schools to universities. Currently approximately 80% transition to high school, and only 40% transition to universities. Last year, approximately 800,000 did KCPE, and those that sat for KCSE were approximately 500,000. This leaves about 150,000 primary graduates and about 300,000 secondary school graduates without a way of progressing their learning. This is the gap TVET must fill. TVET training has not be correctly placed both in the minds of learners, tutors, parents, and even the public. Often, my teacher would tell us that if you fail the final exams, you will only be able to earn a place in the village polytechnic school - where tailoring, masonry, carpentry, welding and other skill-based courses were taught – solidifying the perception that artisans are a ‘last resort’ occupation. We must seriously and urgently counter these perceptions for the artisans and graduates of TVET to be able to earn a decent pay, and enhance policies that protect the remuneration of their craft. Unlike other trades such as law, teaching, engineering, accounting, and medicine amongst others which are well organised into associations to foster the welfare of the members, artisans operate with no organized representation, a poor public image and little to no enforced national legislation for minimum labour standards or occupational safety regulations, the artisan and construction workers are vulnerable to exploitation. This has further been complicated by the fact there are many people who practice in this same space without any certificate. A way must be found to weed out the quacks from the industry. The genuine practitioners should be availed opportunity to get certification while on the job, and slowly progress to a situation where in order to practice, you must show certification. Furthermore, organized foreign artisans have been able to take advantage of this situation, win contracts and displace Kenyan workers. This is a losing situation for Kenya. Our artisans could literally be building our country and contributing to the Kenyan economy, but instead those jobs are going to foreign nationals who spend a small percentage of their wages inside the Kenyan economy. Knowing the numbers we are talking about, it should concern all policy makers to think of innovative ways to keep these TVET graduates in employment. This will significantly lower the unemployment pressure exerted by un-employed youths. Some efforts to mobilize the artisans to achieve the above goals have been made, and we know there are many such efforts out there that could be consolidated to address this problem. Global Communities, an International Non-Governmental Organization, operating in over 20 countries in the world, is pioneering the concept of worker-owned cooperatives as one of the means to unite the artisans, and create a pool of talent which the public could run to for guaranteed quality service. FundiTech, a pre-cooperative of artisans and craftsmen in Nairobi County, supported by the USAID/EMIRGE program, is endeavouring to change this status quo narrative. As an association of skilled artisans or “Fundis” they are coming together using the worker-owner cooperative business model, to build their own business of professionals that they know can change the face of fundis (artisans) in the country. FundiTech wants to become a “one stop shop” where clients can get any quality service in the building and construction industry, from project design to interior finishing. As worker-owners, FundiTech members can set the terms of their own employment, ensure members know their rights and remove avenues for exploitation, while ensuring wages earned are commensurate to the skill provided. As a social enterprise the cooperative is envisioned to improve the standards of living of artisans and also providing soft skills on professionalism, customer service, workforce standards, and others that will improve the client interactions and the perception of the Kenyan Fundi. By providing ownership in the form of shares to the members (artisans) the worker-owner element incentivizes them to work to the best of their ability in order to enhance the reputation and profitability of FundiTech. We hope the many efforts out there to this end could be shared and that a more robust TVET promotion and investment would be made to give the millions of our young people a chance in life, now and in the years to come. I became a member of EMIRGE Mongolia team quite recently, in March 2017. Straight away, I got immersed into the activities, which our team conducts for the program-supported co-operatives as well as dairy and vegetable sector stakeholders. My role in the project is as a Monitoring, Evaluation & Learning Specialist. In this role, I would like to share my knowledge of an activity that is facilitating how different co-operatives are learning and collaborating with each other. This activity is playing an important role not only within the EMIRGE co-operatives in Mongolia, but also in global co-operative development. The activity is the “Co-operators’ World Club,” initiated by the EMIRGE Mongolia team in August 2016. At the time, there were no any other similar set-ups in Mongolia, and there was a need for such a club in order to provide continuous flow of information and knowledge, and thus, to support the smooth development of the EMIRGE-supported co-operatives. The Club provides a lasting opportunity for the co-operatives to share their experiences, exchange ideas and best practices. On the other hand, through the Club, the EMIRGE team is organizing discussions on the co-operatives’ challenges, on improving the governance and leadership, increasing the efficiency of cooperative businesses, and other capacity building activities. The Club members meet on the monthly basis in Ulaanbaatar in a venue provided by EMIRGE. Any member of the EMIRGE co-operatives can attend it, but from the experience so far, mostly the co-operative leaders or the most active co-operative members regularly join the Club meetings. Sometimes, members of a certain co-operative takes turns, so that the coverage is even and they can substitute the members busy at the co-operative’s site. ​Each monthly meeting is being held under a specific agenda related to the co-operative development, which is covered by using interactive facilitation tools, such as active knowledge exchange, case presentations and group discussions. Many crucial co-operative development subjects, such as expanding membership, motivating existing members, conducting efficient all members’ and Board of Directors’ meetings, financial regulations and reporting, creating transparency and resolving internal disputes have been discussed at the Club. In addition, each Club meeting has a sub-topic discussed, which is not necessarily directly linked to the cooperative development, but, nevertheless, the Club members are interested in. As an example, as a person with the public health background, I had an opportunity to present about the nutrition basics and organize a small interactive trivia game on it, which the Club members clearly enjoyed. ​I believe that the Club is a valuable platform that is presented as an informal and friendly environment where the members can freely exchange not only their knowledge and experience, but also are giving each other much needed advice. In many occasions, the Club members discussed together the challenges faced by a certain co-operative and would come jointly to a good solution. I observed that the Club members also are attracted by the welcoming atmosphere. What is more, the Club helps to create a really effective network among all the program co-operatives, and they continue to interact outside the meeting room to visit each others’ sites to exchange and sell products. The Club is a successful activity and the members have further plans to develop the Club. For example, they created their own logo and EMIRGE is supporting the Club in its branding and promotion among local communities and outside co-operatives. Also, Club members are considering establishing the Co-op World Club’s branches at local sites. ​The 2017 general elections have had twists. After the nullification of the August 8th 2017 presidential elections, repeat presidential elections will be held on 17th October 2017. The Supreme Court annulled the presidential poll results on the basis of ‘illegalities’ and ‘irregularities’. Before, during, and after the elections, Kenya is characterized by cases of political tensions and chaos in parts of the country. A key lesson from these occurrences, is the unpassed test of the spirit of democracy, social justice and peace building. The immensity of ‘steam’ thereof, seriously threatens to ‘choke’ the nationhood and socio-economic activities. This connotes a citizenry whose aspirations are dampened by the current nation’s value systems. One thing that seriously needs redress in Kenya, to end periodic electoral malpractices and political tensions and violence, are community structures to nurture democratic and societal values that re-define citizens’ principles. Just as the ‘Nyumba Kumi’ initiative has helped to curb community-level insecurity, co-operative societies are such community structures – to promote authentic democracy, social justice and peace. How? It is in the annals of Kenya’s history how the co-operative and labor movements played a critical role in the country’s independence. The independence brought tears of joy and not anguish. Peace, Love, Unity and ‘Harambee’ (self-help) became the country’s slogan. Subsequently, the country’s history has shown that the slightest interference with co-operative and labor movements deteriorates the slogan and the spirit thereof. The results have been growing tribalism (and even nepotism and clannism), corruption, intolerance, tension, violence, and many more social ills; not only at the national, but also at the regional and community levels. Co-operative structures, principles, and values can remedy these ills. How? Firstly, co-operatives are democratic business organizations equally owned and controlled by a group of community members by common-bond admission – all are co-operators, period. Membership is none discriminatory – no tribe or region is greater than the other. One member one vote – and no dead voter or voting by proxy during the election of leaders or policy. Because co-operatives are democratically owned by community members, co-operatives keep much of their money and jobs in their communities. Much of co-operative’s money is not stuffed in foreign banks; jobs are created for people living in the co-operative community – youth, women and people living with disability. Secondly, co-operatives offer achievable and practical solutions, to many economic, environmental and social problems that can be implemented right now. ‘Manifestos’ shouldn’t just impress the electorates, but should also be achievable and practical, based on the strategic plan or vision of the co-operative, and economic factors. Thirdly, co-operatives are an empowerment means for self-help and solidarity of members. Co-operative leadership builds infrastructure, such as the industrial parks. They promote community empowerment rather than giving hand-outs among its populace, to attract votes. Everyone has a gift and should therefore engage in co-operative community and business building. This should be the path of Kenya’s politics. Fourth, co-operative members equally share the burden in hard times and equally share benefits in good times. The co-operative’s populace is not ‘forced’ to share grief in hard times – to pray or even sympathize with ‘our leader’. Co-operatives emphasizes the need to genuinely embrace the shared leadership and ‘citizenry’. Fifth, co-operatives strive to make members’ lives, communities and economies more just, equitable and democratic. The leaders are transparent about what they borrowed or generated and how they used it for the co-operative’s sake, they do not lie or engage in cheap public relations, and they do not disfranchise members nor offer skewed development on perceived voting patterns. It cannot happen, because members are well educated and informed on their rights and responsibilities as shareholders. Sixth, co-operatives are more resilient in economic downturns and in impoverished communities. Being viable and just alternatives for meeting social and economic needs, co-operatives do not shut down, or lay off, or fail to pay workers. Instead co-operative members pull together to work out solutions – without castigating fears or intimidating others. Furthermore, leaders do not ‘loot’ the co-operative through shady ‘solution’ deals such as importation of raw materials, and privatization of co-operative businesses, without following the by-laws. Finally, co-operatives are an international movement. There are thousands of co-operatives around the world making significant impact locally and globally. Co-operatives are implementing sustainable development goals, and undertaking actions that positively impact neighbors, and the whole globe. A true co-operator is made to use the ‘head’ and not the ‘belly’ to think, talk and act. Social and political injustices and tensions thereof are fueled by the ‘belly’ values. Community structures like co-operatives instills ‘head’ values of, ‘I am because WE are, and since WE are, therefore I am’, as postulated by Kenya’s own Theologian, John Mbiti. If this rings a bell on ways and means of promoting democracy and/or ending tribalism, corruption, tensions and violence in Kenya, then the roots of co-operatives in the country must be retraced and embraced. Promotion and strengthening of the co-operative societies in the country need serious re-examination and consideration under the new government(s). The USAID/EMIRGE program in Kenya is such a co-operative development initiative, empowering youth, women and people living with disabilities in Kenya’s rural and informal settlements, to address community love, peace, unity and prosperity. Let us create an environment for co-operative development and promote co-operatives for nurturing democracy, social justice and peace building in the countries and communities!